2014 Commission letters and agency responses are provided as PDF files below. Download times of large PDFs will vary based on connection speed. Additional information on PDFs. Draft environmental assessment regarding manatee wildlife viewing for the Crystal River National Wildlife Refuge in Florida. Application from Point Blue Conservation Science to take marine mammals incidental to conducting seabird research activities in California. Notice of intent to prepare a programmatic environmental impact statement on the issuance of incidental take authorizations for beluga whales and other marine mammals in Cook Inlet, Alaska. Application from the U.S. Air Force to take marine mammals incidental to conducting maritime weapon systems evaluation program activities at Eglin Air Force Base off Florida. Application from Briana Witteveen to conduct research on large whales in Alaska. Application from the Gulf of the Farallones National Marine Sanctuary to take marine mammals incidental to black abalone research in the Farallon Islands, California. Notice of intent to prepare an environmental impact statement for Cook Inlet Lease Sale 244. Request for information on the development of a long-term monitoring plan for marine mammals in the Gulf of Mexico. Permit application from the University of Alaska, Museum of the North, to collect, receive, possess, import, and export samples from marine mammals under the Service’s jurisdiction. Application from the National Science Foundation and Antarctic Support Contract to take marine mammals incidental to a marine geophysical survey to be conducted in the Ross Sea. Application from the National Marine Mammal Laboratory to collect, receive, possess, import, and export marine mammal samples. Application from Terrie Williams to conduct research on captive sea otters. Proposed modified provisions for the Massachusetts Restricted Area as part of the Atlantic Large Whale Take Reduction Plan to reduce the entanglement of right whales in commercial fishing gear. Funding priority for conservation and recovery of Alaska Pinniped Research Program. Amendment to Snapper Grouper Fishery Management Plan to rescind seasonal closure of black sea bass pot fishing. Application for the National Marine Mammal Laboratory to conduct aerial surveys of polar bears and walruses in Alaska. Application from the Alliance of Marine Mammal Parks and Aquariums to receive, possess, import, and export samples from marine mammals under the Service’s jurisdiction for scientific research. Request for information on southern right whales and sperm whales for use in five-year reviews of the their status under the Endangered Species Act. Application from Randy Sacco to receive and possess samples from dolphins for scientific research. Petition from the Save the Manatee Club and the Sierra Club to seasonally prohibit public access to the Three Sister Spring to minimize harassment of manatees. Application from Ari Friedlaender to conduct research on cetaceans in Antarctica. Amendment of permit to take sperm and humpback whales incidental to the California thresher shark/swordfish drift gillnet and Washington/Oregon/California sablefish pot fisheries. Application from Point Blue Conservation Science to amend its permit to conduct research on pinnipeds in California. Application from Christopher Marshall to import, receive, and possess dugong samples for scientific research. Application from Northeast Gateway to take marine mammals incidental to operation and maintenance of a liquefied natural gas facility in Massachusetts Bay. Application from the Partnership for the Interdisciplinary Study of Coastal Oceans to take of marine mammals incidental to conducting rocky intertidal monitoring activities. Application from BlueCrest to take marine mammals incidental to exploratory drilling activities in Cook Inlet, Alaska. Application from U.S. Coast Guard to take marine mammals incidental to replacement of structures at its Station Monterey in Monterey, California. Application from San Francisco Bay Area Water Emergency Transportation Authority to take marine mammals incidental to construction of its Central Bay Operations and Maintenance Facility in Alameda, California. Application from Apache Alaska Corporation, SAExploration, Inc., and BlueCrest Energy Inc. to take sea otters incidental to oil and gas exploration activities in Cook Inlet, Alaska. Application from Navy to take marine mammals incidental to pile driving and removal in association with a pier replacement project in San Diego Bay. Call for information on Beaufort Sea lease sale 242. Draft Supplemental Environmental Impact Statement/Overseas Environmental Impact Statement for training activities to be conducted from within the Temporary Maritime Activities Area in the Gulf of Alaska for five years. Application from the Navy to take marine mammals incidental to training activities to be conducted within the Temporary Maritime Activities Area in the Gulf of Alaska. Petition submitted by the Pribilof Island Aleut Community of St. George Island, Traditional Council, to take 150 male fur seal pups per year for subsistence purposes. Notice of receipt of application submitted by Apache Alaska Corporation to take marine mammals by harassment incidental to seismic surveys in Cook Inlet, Alaska. Petition to reclassify the West Indian manatee from endangered to threatened under the Endangered Species Act. Presidential Task Force on Combating Illegal, Unreported, and Unregulated Fishing and Seafood Fraud. Permit application from the University of Florida seeking to conduct research on manatees. Petition to designate the central North Pacific humpback whale as a discrete population segment under the Endangered Species Act. Application from Maine Department of Transportation to take marine mammals incidental to construction activities in Eastport, Maine. Application from the Navy to take marine mammals incidental to pier maintenance at Naval Base Kitsap in Bremerton, Washington. Application from the National Science Foundation and Antarctic Support Contract to take marine mammals incidental to a geophysical survey in the Scotia Sea and South Atlantic Ocean. Application from Lamont-Doherty Earth Observatory and the National Science Foundation to take marine mammals incidental to a geophysical survey off North Carolina. Permit application from Spiegel TV to film polar bears in Alaska. Application from the Port of Friday Harbor to take marine mammals incidental to a marina repair and reconstruction project in Washington. Oregon State University’s environmental assessment for the Pacific Marine Energy Center’s South Energy Test Site. Request for information on preparation of 2017 – 2022 Outer Continental Shelf oil and gas leasing program. Application from the Marine Corps to take bottlenose dolphins incidental to training operations at the Cherry Point Range Complex. Application from SAExploration, Inc. to take marine mammals incidental to seismic survey program in Beaufort Sea. Application from ExxonMobil to take marine mammals incidental to the installation of six conductor pipes in the Santa Barbara Channel, California. Application from Stephen Trumble to amend his permit for the import/export of earplugs of whales. Notice of intent to prepare an environmental assessment on Principle Power wind energy development off Oregon. Application from U.S. Geological Survey to take marine mammals incidental to a geophysical survey in the western North Atlantic. Application from Jamie Lloyd-Smith to amend his permit to conduct research on California sea lions. Application from Yukon Route Productions to film walrus subsistence hunt. Application from Terrie Williams to conduct research on Weddell Seals in McMurdo Sound, Antarctica. Application from Renegade Pictures to film polar bears. Call for information to determine potentially significant issues related to the outer continental shelf offshore New York for future wind energy leasing. Application from Heather Liwanag to receive, import, and export marine mammal specimen for scientific research. Request comments on authorization of incidental take of whales by Hawaii longline fisheries. Permit amendment application from the National Marine Mammal Laboratory to amend its pinniped permit for research activities in Washington and Oregon. Application from Poles d’images to film polar bears in Alaska. Application from the Navy to take marine mammals incidental to construction of a wharf at Naval Base Kitsap in Bangor, Washington. Application from Matson’s Laboratory to possess, receive, import, and export polar bear teeth. Application from Glacier Bay National Park to take small numbers of pinnipeds incidental to conducting seabird surveys. 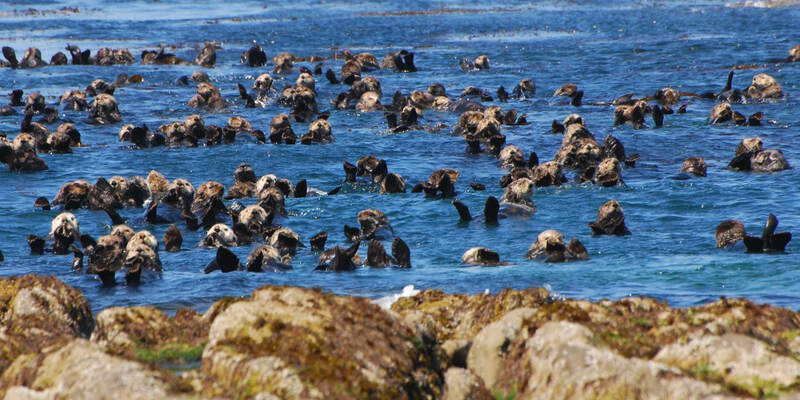 Application from Monterey Bay Aquarium to conduct research on sea otters. Proposed amendment to the Bottlenose Dolphin Take Reduction Plan to reduce bycatch from the species’ northern North Carolina Estuarine Stock. Application from Open Lens Productions to film walruses at Round Island, Alaska. Application from Alan Springer to conduct research on walruses in Bristol Bay, Alaska. Application from Robert Pitman, Southwest Fisheries Science Center, to conduct research on numerous cetacean species in Antarctica. Application from National Marine Mammal Laboratory to amend its permit to conduct research on northern fur seals in Alaska and California. Application from Alaska Department of Fish and Game to conduct research on Steller sea lions in Alaska. Application from the National Marine Mammal Laboratory to amend its permit to conduct research on pinnipeds in Seattle, Washington. Application from ABR, Inc. to conduct research on sea otters in Alaska. Application from BP Exploration (Alaska) Inc. to take marine mammals incidental to a three-dimensional seismic survey in North Prudhoe Bay, Beaufort Sea, Alaska. Application from BP Exploration (Alaska) Inc. to take marine mammals incidental to a geohazard survey in Foggy Island Bay, Beaufort Sea, Alaska. Application from Buccaneer Alaska Operation, LLC to take marine mammal incidental to exploratory drilling in Cook Inlet, Alaska. Environmental assessment on an interim policy lease for wind resources data collection off Tybee Island, Georgia. Application from Steven Kazlowski to photograph polar bears in Alaska. Application from Terrie Williams to conduct research on Weddell seals in Antarctica. Application from Alaska SeaLife Center to conduct research on Steller sea lions in Alaska. Application from Alaska SeaLife Center to conduct research on captive Steller sea lions. Application from Tamara McGuire to amend her permit to conduct research on beluga whales in Cook Inlet, Alaska. Lease request from the Northwest National Marine Renewable Energy Center to conduct marine hydrokinetic technology testing on the Outer Continental Shelf off Newport, Oregon. Application from the National Marine Mammal Laboratory to conduct research on Steller sea lions. Application from the Southeast Fisheries Science Center to amend its permit to include satellite dart tagging of cetaceans. Application from Deepwater Wind Block Island Transmission LLC to take marine mammals incidental to construction of the Block Island Transmission System off Rhode Island. Application from Deepwater Wind Block Island Wind Farm to take marine mammals incidental to construction of the Block Island Wind Farm off Rhode Island. Application from City of San Diego to take marine mammals incidental to construction activities associated with the Children’s Pool lifeguard Station in La Jolla, CA. Application from Alaska Department of Fish and Game to amend its permit to include photo-identification of gray whales. Application from Alaska Department of Fish and Game to amend its permit to include various survey methods for ice seals and the use of remotely-delivered sedatives to capture adult bearded seals. Application from U.S. Coast Guard to take marine mammals incidental to repair activities at Station Monterey in California. Application from Mervi Kunnasranta to film harbor seals in Lake Iliamna, Alaska. Application from Southwest Fisheries Science Center to amend its permit to include additional survey methods and tagging of numerous cetacean species. Application from Furie Operating Alaska LLC to take marine mammals incidental to a proposed 3D seismic survey in Cook Inlet, Alaska. Draft National Marine Fisheries Service Stock Assessment Reports for marine mammals occurring in U.S. waters. Threat of hydropower dam construction to the critically endangered freshwater dolphins in the Mekong River. Application from the Navy to take marine mammals incidental to training and testing in the Mariana Islands Training and Testing area (MITT). Application from Lamont Doherty Earth Observatory to take marine mammals incidental to a Northwest Atlantic seismic survey off New Jersey. Application from the Navy to take marine mammals incidental to missile launches from San Nicolas Island, California. Application from Dr. Alejandro Acevedo-Gutierrez to conduct research on harbor seals in Washington. Application from Northwest Fisheries Science Center Forensic Laboratory to acquire, possess, import, and export parts from marine mammals worldwide. Application from Sonoma County Water Agency to take marine mammals incidental to Russian River estuary management activities in California. Application from the Aleut Community of St. Paul Island to add northern fur seal habitat-use studies and extend the permit for one year. Application from the Navy to take marine mammals incidental to road and airfield repairs on San Nicolas Island, California. Application from Cape Wind Associates to take marine mammals incidental to a high-resolution geophysical survey in Nantucket Sound off Massachusetts. Petition to exempt dredged channels from vessel speed restrictions in seasonal management areas that protect endangered North Atlantic right whales. Application from the St. George Reef Lighthouse Preservation Society to take small numbers of pinnipeds by harassment incidental to aircraft operations and restoration and maintenance activities at the St. George Reef Light Station off the coast of Crescent City, California. Draft guidance regarding the acoustic thresholds for activities causing an onset permanent threshold shift and temporary threshold shift for marine mammal species under the Service’s jurisdiction. Application from the Navy to take marine mammals incidental to training and research, development, test, and evaluation activities to be conducted from 2015 to 2020 within the Northwest Training and Testing study area. Draft Environmental Impact Statement/Overseas Environmental Impact Statement for training and research, development, test, and evaluation activities to be conducted from 2015 to 2020 within the Northwest Training and Testing study area. Draft Programmatic and Phase III Early Restoration Plan and Draft Programmatic Environmental Impact Statement regarding early restoration in the Gulf of Mexico. Application from Versar to amend its permit to conduct research on cetaceans and pinnipeds along the Atlantic coast. Permit application from Dr. Darlene Ketten to receive, possess, import, and export samples from any species under National Marine Fisheries Service jurisdiction during a five-year period. Permit application from the BBC to take sea otters incidental to filming activities in Cordova Harbor, Alaska. Application from Apache Alaska Corp. to take small numbers of marine mammals incidental to a 3D seismic survey in Cook Inlet, Alaska. Application from the National Science Foundation to take small numbers of marine mammals incidental to a marine geophysical survey to be conducted in the Dumont d’Urville Sea off the coast of East Antarctica. Application from Transcontinental Gas Pipe Line Company to take small numbers of marine mammals incidental to operations associated with the expansion of a sub-sea natural gas pipeline system from Lower New York Bay Lateral to onshore delivery on Rockaway peninsula. Permit amendment application from the Pacific Whale Foundation to change the type of taking of false killer whales incidental to conducting humpback whale research to Level B harassment associated with false killer whale research. Permit application from Dr. Ari Friedlander to conduct research on killer, humpback, minke, and Arnoux’s beaked whales in Antarctica. Permit application from the BBC to take polar bears incidental to filming activities in Barrow, Kaktovik, and the Arctic National Wildlife Refuge, Alaska.